I went to listen to and film the ROHINGYAN Appeal tonight in Sydney. They’ve been stripped of citizenship, driven off the land and killed by the hundreds of thousands since 1942. They are starved, reproduction is curbed and they are not allowed to own a phone. An estimated 8000 have been cast adrift at sea. 200 have died already and many are in acute need of medical attention. Under international pressure, Myanmar has just carried out its first rescue mission, taking about 200 back to the wide-spread persecution they fled. These people are referred to as ‘Bengalis’, and are part of a Muslim Rohingya minority of 1.3 million who have been living in Burma for many generations, but who are not recognised as citizens. from its Prime Minister Tony Abbott. It’s tricky… Tony won his election campaign on an arguably cruel policy of pushing back asylum-seeker boats, whatever the circumstances, and despite Australia’s international obligations as a signatory to the Refugee Convention. His government have since been referring to boat people as “illegals”, and maintaining a high level of secrecy, regarding the “Operational Matter” of getting rid of them. 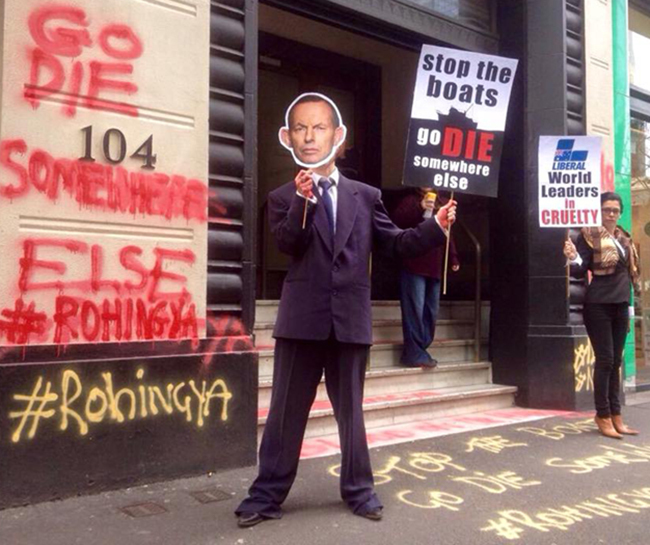 It is therefore unsurprising that in a recent poll, 38% of Australians said no to rescuing the dying Rohingyans. Over one in three Australians say no. It has been suggested that this wave of first-world apathy, which is not unique to Australia, has influenced our neighbours. But Indonesia, which has mercifully relented, is not even a signatory to the convention. Abbott’s ‘no brainer’ position is that these people should have joined a queue, and it is of little interest to the right-wing leader that there was no queue for Rohingyans. Are we so different Australia, from the regimes that create this level of apartheid, or is it just a question of degree, our awareness of it, and time? This entry was posted in LIVING PROOF, NEWS. Bookmark the permalink.